I’ve been on the road a lot this week. I have clients on TV and radio shows in Chicago and New York. Plus, I stopped by the set of the show, “Matter of Fact” in Washington, DC. I produce stories for the show. “Matter of Fact” is anchored from inside the Newseum. Have you been there? It’s an interactive museum that takes you through the evolution of the earliest print and electronic communication to the technologies of the future. As I worked on a story for “Matter of Fact” this week, I realized how many people make a huge error when it comes to getting booked in the media. Do you want to be seen as the expert the media should call when something happens in your industry? Here’s something people do all the time — and I want you to learn from them (and me) and not make the same mistake! Along my journey as a TV producer, I’ve been asked several questions that I’d like to answer for you. How do you get the media attention you deserve? What makes a good TV story? How can you become the go-to expert the media calls first? How can you have more confidence on stage? If you’re ready to take yourself to the next level and learn insider secrets from my 20 years in media — make sure you sign up for my emails where I’ll be dishing out the goods. Let’s produce the best YOU. Speaking of NCAA Basketball Schools… Go Marquette! Is your college in the big dance? The Marquette Golden Eagles play University of South Carolina Friday, March 17. While we’re talking about college… I just stumbled upon this on my Mac today. Tim Cigelske is a Marquette University graduate and teacher. He teaches in the College of Communication. Here’s a beautiful piece Tim wrote about me in Marquette Magazine a few years ago. Thank you, Tim. The article was written when I was an executive producer at NBC. Since then, I created my own company. I am now a media coach and a public speaking trainer. Tim also freelances on the side for some blogs and websites… so if you’re looking for a good writer with an awesome sense of humor… it’s him. Kathryn Janicek does more by 4 a.m. than many people accomplish all day. As executive producer for NBC Chicago’s morning TV show, her workday starts shortly after midnight, when she opens her email and begins planning the news for more than 200,000 daily viewers. No longer does breaking news start on the air. Now, she has to make sure stories are tweeted, posted on Facebook, and followed up on and updated on the website. That’s in addition to deciding where her reporters will travel and what items her writers will craft. She doesn’t mind the relentless pace. In fact, she thrives on it. Few in the news media have adapted faster to this rapidly changing landscape than Janicek, Comm ’98. She received an Emmy for outstanding achievement for interactivity and the Illinois Broadcasters Association’s Silver Dome Award for best use of new media. Taking risks and blazing trails is nothing new for Janicek, who displayed these same characteristics at Marquette. She wanted to be hands-on from the beginning, which is why she chose Marquette’s broadcasting program and Milwaukee’s internship potential after being accepted into prestigious journalism programs at schools such as the University of Missouri. Havice noticed that Janicek sought out new or challenging ways to tell stories, as well as opportunities for personal and professional development. This included interning at WISN Channel 12 during her freshman year and working as an overnight associate producer at WITI Channel 6 during her junior year. She also was the College of Communication’s president and responsible for organizing a memorial for Chris Farley when he died during Christmas break in 1997. Her experience paid off immediately after graduation, when she landed a job as a morning producer for the CBS affiliate in Champaign, Ill. Janicek was destined for bigger markets and arrived in Chicago 3 1/2 years ago as a producer at WGN, which led to her current role at NBC as executive producer of the morning show. Today, Janicek relishes the responsibility of preparing her viewers for the day. She admits she has little downtime, but that’s just fine with her. https://kathrynjanicek.com/wp-content/uploads/2017/03/BradleyCenterInterior.jpg 300 600 Kathryn Janicek https://kathrynjanicek.com//wp-content/uploads/2017/08/KJ-logo2-1.png Kathryn Janicek2017-03-15 23:45:302017-04-14 19:37:24Speaking of NCAA Basketball Schools... Go Marquette! My mother walked into my elementary school wearing white shorts with her leopard bikini underneath. You could see it peeking through. She was that mad. She didn’t care what she was wearing. She was on a mission. Yesterday, I checked in with a friend. She now lives in a new city and wants to join a club nearby. The rule is – you have to be sponsored to get in, and the husband in the household has to sign in order to sponsor a woman to join the club. That’s right, in 2017 this club requires her husband’s permission for her to join. Instead of asking for her husband’s signature, this friend of mine is gathering signatures of her female friends who are members. These female friends have careers, raise children and are EQUAL partners in their households. Sure, my friend could have chosen to walk away from the club and its archaic rule that she doesn’t like. Instead, she is trying to teach others in the community – men and women – that they should change the policy. By standing up for herself, she is teaching them to STAND UP for themselves. By being a strong woman, she is also teaching her daughter how to stand up for herself. I was in sixth grade when my mom marched into the principal’s office at my elementary school. She was furious after I told her that I wasn’t going to be allowed to take a test for an accelerated level junior high math class. The boys could take it – girls couldn’t. We were living in Sandy, Utah at the time. And no, this wasn’t the 1950’s… it was 1988. When my teacher explained to my mom that the test was designed only for college-bound students to be able to place into a higher math class, she was livid! Why wasn’t her daughter invited to take the test? I had the grades and the skills, just not the “right” gender. Unhappy with my teacher’s answers, she took her fight to my principal’s office. What makes the story funny (because the fact that she had to fight for me at all is certainly not funny) is that my mom was so livid when I came home that day and told her what was happening… she jumped right off of her sunning chair in the backyard, threw on her shorts, grabbed me and walked me back into school. White shorts, leopard bikini and all. She didn’t care. She was going to make things right. My mother always stood up for her three daughters. She taught us to do the same. Her white shorts and leopard bikini were funny, but what makes the story memorable is that my mom let nothing deter her from standing up for me. This is what strong women do; strong women stand up for themselves. 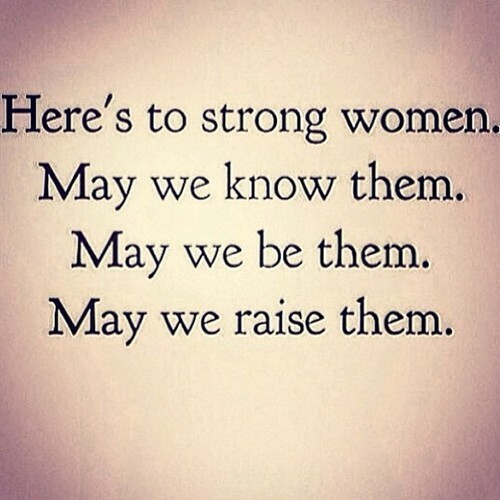 I am surrounded by strong women. We learn from each other, inspire and support each other. I teach women how to be stronger, more confident and how to stand out in their field. Let me teach you how to stand up for yourself and get the media you deserve. Sign up here for my free media class I’ll be teaching in April.